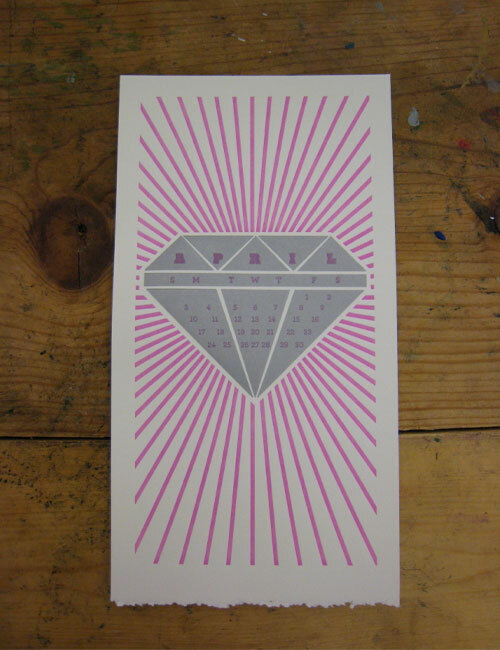 I participated in the Pyramid Atlantic Letterpress calendar once again this year with other members of the Pyramid Atlantic letterpress community. Each month was designed by a different artist. I chose April because it is my birth month and decided to focus on its birthstone, the diamond. 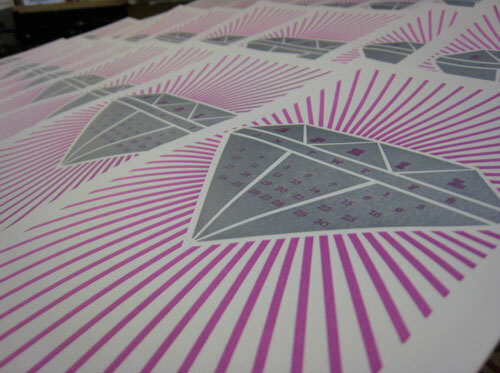 It is a 2 color design using silver and magenta ink. There are still some calendars available for purchase. It’s $25 this year, which is a steal if you ask me! They are working on having it for sale on the Pyramid website but until then Update: Available for order on the website or you can purchase it at ArtSpring 821 Wayne Avenue, Silver Spring MD). All proceeds go to Pyramid Atlantic Art Center. Tags: 2011 calendar, fancy seeing you here, fancyseeingyouhere, letterpress, letterpress calendar, pyramid atlantic art center, pyramid atlantic letterpress calendar, sarah hanks, Sarah Hanks Ltd. 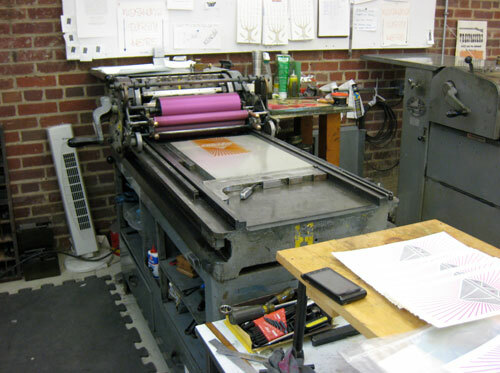 This entry was posted on Monday, November 15th, 2010 at 5:11 pm	and is filed under design, letterpress, personal designs. You can follow any responses to this entry through the RSS 2.0 feed. You can leave a response, or trackback from your own site. Can I buy a calendar from you?